Well, the Fourth of July is almost upon us. It's the quintessential American holiday...a day that Americans of all stripes come together to celebrate their principles and their history. And to celebrate the American Experience. And what could be more American - or more of the "American Experience" - than a stay at a real Western ranch, Pardner, with real cows and horses and cowboys and some mighty fine grub. And if your ranch happens to be luxurious, as well...who's gonna complain? 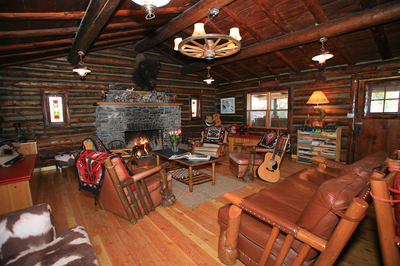 (The living room is a nightly gathering spot at Rimrock Ranch. #5 - RIMROCK RANCH, CODY, WYOMING - Rimrock Ranch has been welcoming guests for authentic ranch vacations since 1955, when Glen and Alice Fales bought the 1926 ranch. And it's still in the family, now operated by their son Gary and his wife. 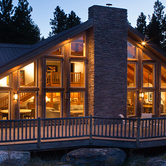 The ranch sits right on the banks of Canyon Creek, with panoramic views of Wapiti Valley and the Absaroka Range. Its location is perfect - midway between the wonderfully-Western town of Cody and Yellowstone National Park, 25 miles from each. Minimum stay here is a week - and it will be a week you never forget. 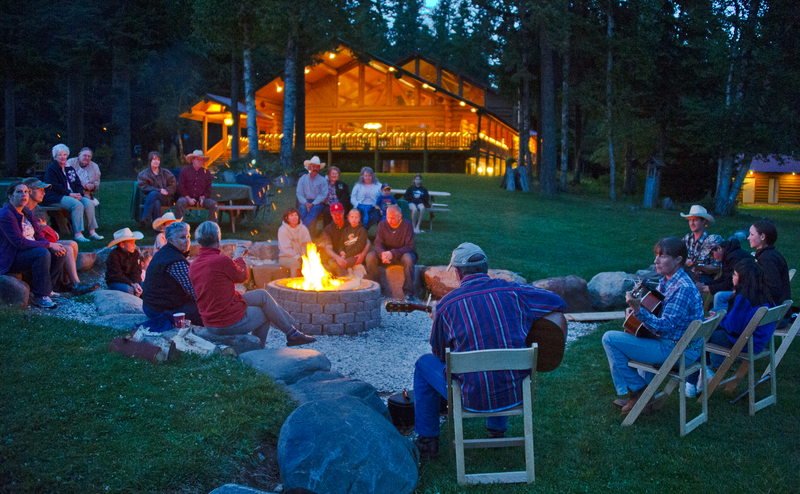 Accommodations are authentic cabins, meals are hearty and family-style, each guest has his/her own horse, and you'll have the opportunity to learn from real cowboys...and then join them in a nighttime sing-along. If you have a taste for thrills, the whitewater rafting is great. If you're here in the summer, you can catch the colorful Cody Nite Rodeo. 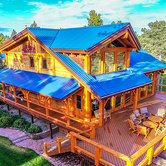 And standard goodies include a breakfast ride, one all-day ride, day-tour of Yellowstone National Park, fly-fishing in a pond stocked with cutthroat trout, heated swimming pool, hot tub and game room. A room with a view at Devil's Thumb Ranch. #4 - DEVIL'S THUMB RANCH RESORT & SPA, TABERNASH, COLORADO - This ranch gets its name from a rock formation sticking up from a nearby mountain. Only 65 miles west of Denver, Devil's Thumb Ranch Resort & Spa has been recognized internationally for its sustainability programs, commitment to historic preservation, locally-sourced restaurant ingredients, and the superb wine collections at both Heck's and Ranch House Restaurant. 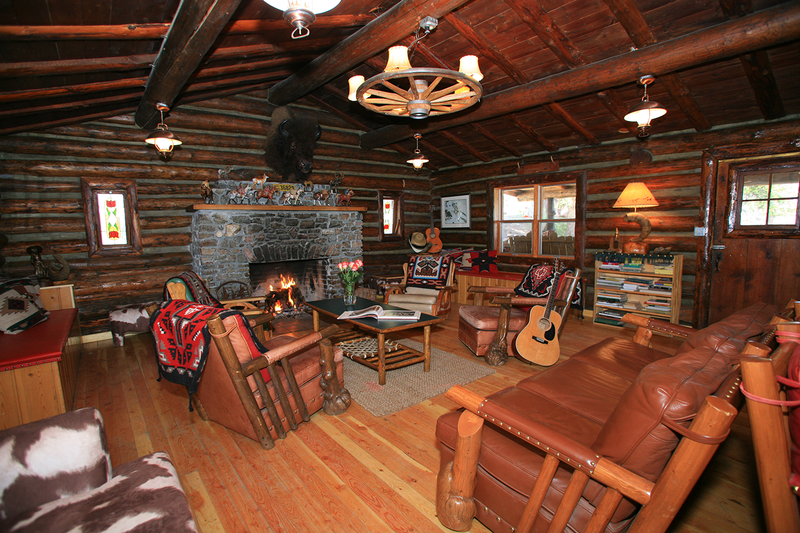 The ranch offers secluded cabins with fireplaces and kitchens, two guest lodges , two good restaurants, 35 miles of trails for hiking and mountain biking in summer, and a 120+ km Nordic trail system for cross-country skiing and snowshoeing in winter. You'll have your own horse for your stay, and you'll guide it on trail rides through breathtaking scenery, and rides that get you up close and personal with the herd. There's hiking, mountain biking, fly-fishing, zip-lining, stand-up paddle boarding (and standup yoga on paddleboards! ), adventure/skill training courses, and a nature-based spa that you won't want to leave. And yoga classes here are a bit different than at other places...because here you'll do your stretching while gazing out at memorable views of the expansive ranch and the Continental Divide. 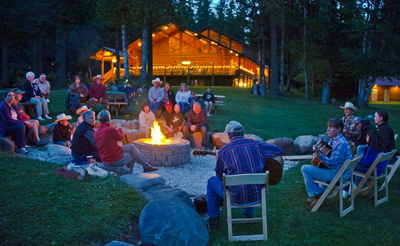 At Western Pleasure Guest Ranch, a post-barbecue sing-along. #3 - WESTERN PLEASURE GUEST RANCH, SANDPOINT, IDAHO - Third-generation owners Janice and Roley Schoonover are already training the fourth - and, soon, the fifth - generation of the family to run this very special ranch. Sitting in the Selkirk Mountains just 40 miles from the Canadian border, and with drop-dead views everywhere you turn, the "family" touch is evident everywhere here. And by the time you leave, you'll feel like a member of the family. You're welcome to watch the goings-on at the stables...and you're welcome to participate, as well. One of the cowboys or one of the Schoonovers will lead you on a trail ride though silent, deep-green forest where you'll occasionally pass stray cows grazing. The Great Room in the main lodge is one of the most impressive I've seen in the West; sitting here, you could be in the 19th-Century instead of the 21st. And eating here, you'll also be treated to some mighty fine grub, Pardner...often cooked up by Roley. Sometimes the family holds an outdoors cookout for dinner, followed by the ranch hands getting out their guitars and banjos for a musical accompaniment to sunset. Evening descends on a Ponderosa Cabin at Triple Creek Ranch. 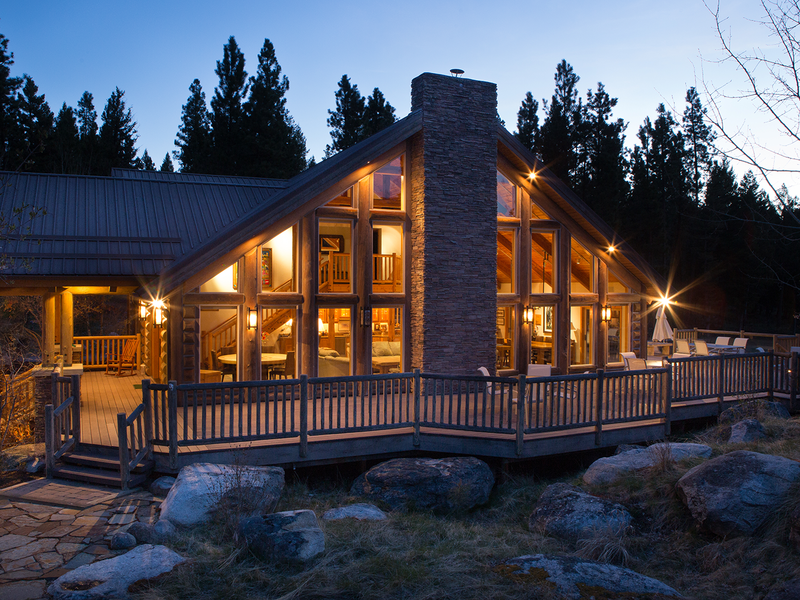 #2 - TRIPLE CREEK RANCH, DARBY, MONTANA - Triple Creek Ranch is a Relais & Châteaux all-inclusive retreat for adults, with 25 luxury cabins surrounded by 4,000,000 acres of National Forest in the Bitterroot Mountains. 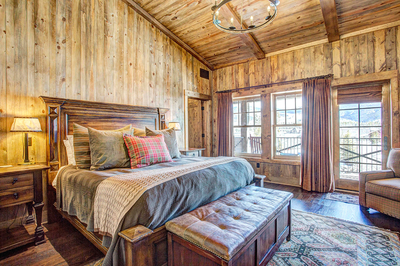 "Cabins" range from spacious suite-like accommodations to three-bedroom lodges, each filled with imaginative pieces from the owners' museum-quality Western art collection. 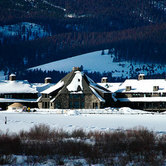 There's also a main lodge with an award-winning restaurant and a wine cellar that's won 10 Wine Spectator Awards. You can fly-fish on the Bitterroot River for trophy cutthroat trout, trap-shoot on a range, and, of course, go horseback riding. 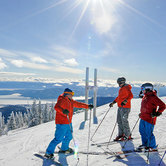 The resort partners with excellent off-site outfitters to bring guests to untouched Montana frontier country, which you can experience on the back of a horse, in a helicopter, on a fishing boat, or behind a dog-sled team. Owners Barbara and Craig Barrett will see to your every need - and they give the resort some incredible star-power. Barbara is former U.S. Ambassador to Finland, astronaut, advisor to four American presidents and a board member of the Smithsonian. Craig is the retired chairman and CEO of Intel. And when you're sitting around the campfire with these folks, you'll hear some incredible stories! 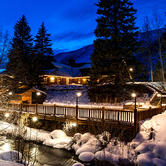 The lodge at C Lazy U Ranch is set amidst stunning scenery. #1 - C LAZY U RANCH, GRANBY, COLORADO - C Lazy U is as authentic-Western as they come. For example, this ranch is known not for its five-star service...but for its "5-Spur Service!" C Lazy U has a reputation as one of Colorado's premier luxury-guest ranches, and it's celebrating its 100th anniversary next year. 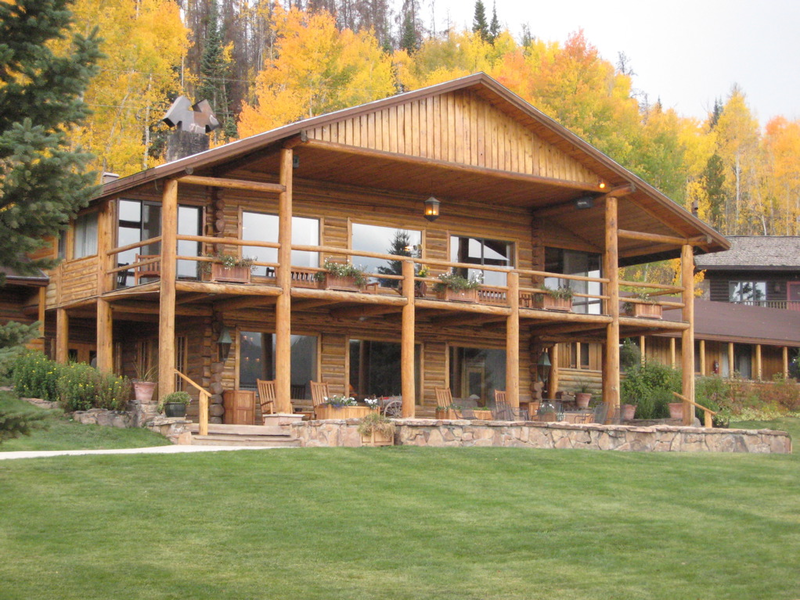 The ranch is located in scenic Grand County, and accessed via 11,000' mountain roads with views that will take your breath away. C Lazy U is one of the few remaining places where guests can experience a vacation that seems like a million miles away from the stresses of everyday life. And a few centuries away, as well, because the rich traditions of the American West are still alive and well here. The ranch has 40 rustically-elegant cabin accommodations and one luxury private home, and guests can enjoy gourmet dining; a full-service Lazy You Spa; and 8,500 acres of adventure. C Lazy U is owned by a local family. And there's ridin' and ropin' for everyone in your family. In warm weather, you can swim, play tennis, ride through the hills on a bike, cross them by foot as you hike past beautiful vistas, go fishing or hunting, try some yoga, or test yourself on the zip-line or ropes course. 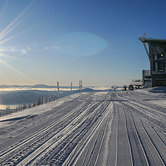 In the winter there's snow-tubing, skating, snowmobiling, snowshoeing, and cross-country skiing - all in a silent, snow-filled wonderland. And all year long, there's fun! Here at The World Property Journal, we're always interested in hearing about your favorites. So don't hesitate to suggest them!